23 May Dietitian Approved Tips for Summer Get Togethers! Looking to celebrate this summer without harming your waistline? Here are some dietitian approved tips for surviving summer get-togethers in a fun and healthy way! Planning ahead helps keep your diet in check, especially at summer get-togethers. Try to plan just one food-related event (picnic, BBQ, etc.) each weekend. This will allow you to fully enjoy the party without fear of overdoing it two days in a row. 2.) Make it a potluck. Make it fun and get everyone involved in the meal! If you’re hosting, you will have more time to spend with your friends and family. If you’re a guest, making a dish yourself will ensure there’s at least one option that you’re familiar with. This can be helpful for those with food allergies and those watching their calories! That sweet tea or sangria may be the drink you want to reach for on a hot summer day, but the calories can add up. It’s important to stay hydrated throughout the day with water and water-rich fruits and vegetables (watermelon, cucumbers, bell peppers, etc.). All foods and drinks can have a place in a healthy diet; the key is to enjoy them in moderation! 4.) Don’t arrive on an empty stomach. Grabbing a piece of fruit or a handful of nuts or chick peas is a great way to avoid overeating and indulging on the most calorie-laden foods at the party. A snack that combines protein, fat, and carbohydrates will keep you feeling full and satisfied and help you to avoid making a beeline to the food table right when you arrive. 5.) Take a break from the food. Try to avoid mindless eating all afternoon! Get active and make a goal to move around and have fun throughout the day. Balancing your intake and your activity is essential for maintaining a healthy weight. 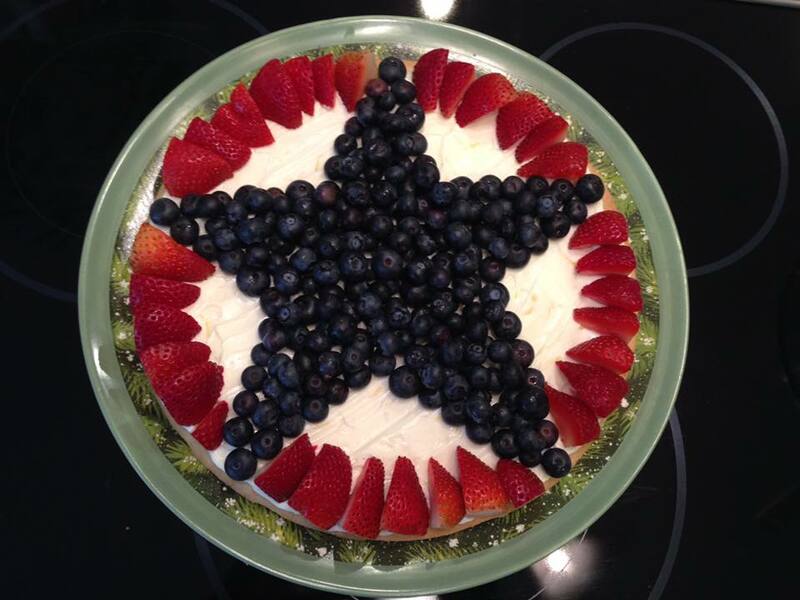 For mine, I only used strawberries and blueberries for the fruit and arranged them in a way that was well-suited for summer! Happy baking!